Almost all philosophers are giving out hints about their views on what philosophy is or frequently express their metaphilosophy explicitly. Uniquely amongst academic disciplines, philosophy has the tools to conceptualise itself and its methods. 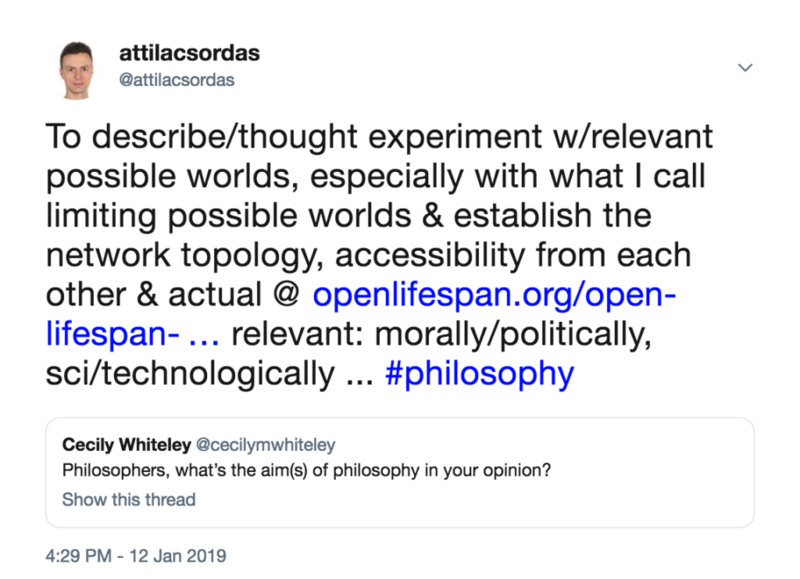 I’m not a particularly metaphilosophical philosopher but it seems that for a more complete analysis of Open Lifespan philosophy it’s better to develop the outlines of the metaphilosophy behind to stay on the exoteric side. Here’s a quick metaphilosophy in a nutshell triggered by a Twitter thread on what’s the aim(s) of philosophy? Please note that I’m interpreting this question as ‘what is the task’, not ‘what is the aim’ of philosophy, and these concepts can be interpreted diversely, but they are definitely metaphilosophical in scope. It is obviously connected to my current Open Lifespan line of thought, relevant links listed in previous post.